Every dog needs grooming, no matter how small or hairless it is, but some need it more than others… like with Lilly and Bunk… Lilly needs a brush and a quick bath, and that is all. Bunk however requires much more work and a detailed knowledge in order to keep him pretty most of the time. The most important tip I can offer in this matter is to know your tools – there are 100s of different tools on the market and believe it or not they all serve a different purpose. Different length of the coat will require a different brush or comb, some might benefit from the use of thinning shears or a special de-matting comb. Doing some research in this area will save you a lot of money and hassle, as having good tools that are the correct tools for the task in hand, will speed up the process and make it much more easy and pleasurable for both you and your four legged friend. While brushing make sure you don’t miss a spot and take special care around ears and tummy areas, so you do not hurt any sensitive parts. Once your dog is all brushed you are ready to proceed further. This part is causing us a bit of a headache, simply due to the size of Bunk. He is not so easy to handle so we end up using the garden hose pipe on him… weather permitted of course… and thus always give him his bath outside. With a standard size dog, you can use your bath or even a shower. Whilst bathing it is important to use quality products, as you really do not want to run the risk of causing a skin irritation. Lately we were using Scruffy Chops shampoo and conditioner. They are perfect for all types of skin including sensitive skin. Scruffy Chops claim to use natural ingredients which are very beneficial for dry, itchy and irritated skin and they do smell divine. We especially like the Muddy Marvellous conditioner, which is made from ingredients like dead sea mud, minerals, oatmeal, shea butter, aloe vera, jojoba seed oil… if you didn’t try it… give it a go. So, when you pick your bathing spot and a selection of bathing product – shampoo, rinse, shampoo, rinse, conditioner wait a few minutes and rinse… just make sure that all product are rinsed off completely before you turn off the taps. Depending on your dog you are looking at towel, a stack of towels or a blow dryer. 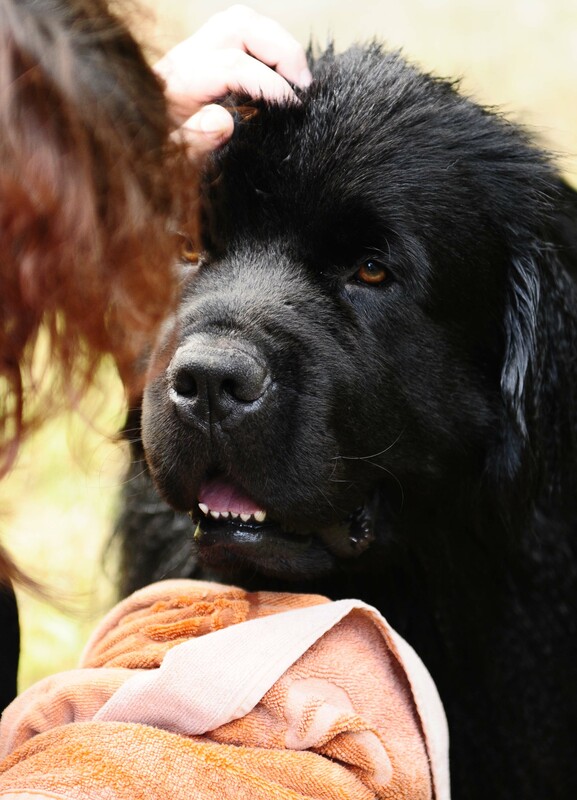 It is important to dry your dog as quickly as you can especially if it is a long haired breed. If you are using a blow dryer be very careful around ear, nose and eyes area. If the weather allows we normally would take Bunk for a walk straight after his bath, this way he can dry a bit in a natural way, which is preferable to the monstrous drying job with a pile of towels and a blow dryer. 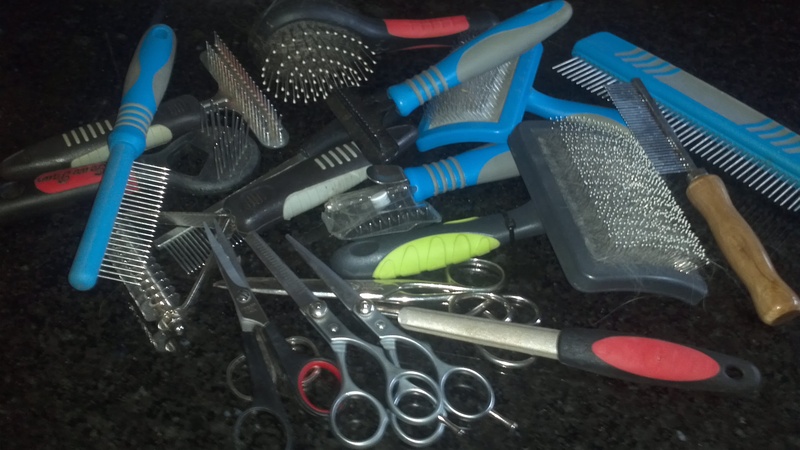 Step Four – Back to Brushing! Now your dog is all clean and dry, so it is time for a proper brushing and re-brushing. If you decide to undertake a trimming task upon yourself, spend some time beforehand and do your research. It is not as easy as it might seem and if you don’t feel very confident it might be advised to look for a professional help in this matter. Depending where you walk your dogs it might be necessary to trim their nails, especially if they don’t do much roadwork. If they are walked a lot on a hard surface you may avoid this part of a routine as nails will have worn down and shouldn’t be long enough. If you walk them on a field predominately you will need to trim and a good nail cutter is a must, so it goes quick and easy. A good quality sharp pair of clippers will make the job easy and drastically reduce the risk of hurting the dog as you try and force blunt clippers to cut through the nail. Now, your dog should be all clean and fluffy, but there are few more things to take care of. We always finish with cleaning the ears and eyes… some people would do teeth at this point as well… we do not. Make sure you have a special dog ear cleaner and be very careful and gentle while doing it… one move that goes too deep and you can really hurt your friend. Make sure when you have finished that you leave their ears nice and dry, never forget to remove all excess liquid you used for cleaning. For our final touch we use an eye cleaner, just to give them this extra sparkle 🙂 and to remove the endless supply of gunk they accumulate in the corner of their eyes. Or maybe you know something which will help speed up the process? 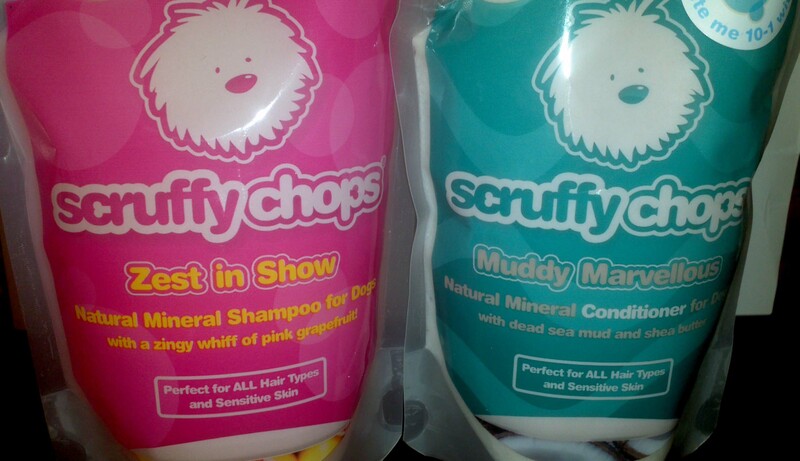 I received one pouch of Zest in Show shampoo and one pouch of Muddy Marvellous conditioner from Scruffy Chops for free for review purpose. All opinions are honest and my own. I used to groom my one dog when she was a puppy, but I don’t have the time to do it anymore so thankfully our housekeeper also does it for me and she always smells so lovely after <3 We actually use normal 'human' shampoo for her. I have a dog but I don’t really treat him as good as you >_< will do your tips from now on~ thanks! I love dogs, but cant get one because my family are all very allergic. Ill definitely be checking out this post when I do finally move out and get a doggie! Thanks for all the tips! I think you pretty much said everything. We have 4 dogs and it can take a lot of time grooming them so my dad usually take them to groomers. such a great tips..gonna tell this to my parent cos they are the one who take care of the dog!! sadly i am afraid of dog.. I can see your tips are useful and very well written. Unlucky I don’t have any pet and I can try those out. always wanted a pet dog! but i’m afraid my cage-free bunny will be terrified. in comparison, bunny grooming is so much easier. I find it so relaxing to take care of a pet, to know that it is totally dependent on me like nothing else in the world. I don’t have any dog. But thank you for the tips. Would love to have one in the future. Amazing grooming tips. Dogs definitely have the good life hehe. Wish they would stay clean for a bit though haha. Back in my home town, we used to have a dog and just after we take her a bath, she’ll be rolling in the dirt again LOL. Thank you for the tips! My Shih Zhu thanks you too! Angel needs these tips. I feel like she is always at the groomer. Thanks for the reminder and thorough info! I really do need to groom my beagle mix more, beyond clipping nails. Brushing often goes by the wayside since she has such short hair. Step eight – dog promptly rolls in mud, burrs, and something really stinky. Step nine – give up. I totally slack on the nails part! lol. Thanks so much for sharing! Great tips! I am so bad at nails. I always freak out and end up taking her to get them professionally done. Bunk is adorable, and positively shining after all that loving care and attention! My mum has recently got a king charles spaniel puppy, I’ll have to point her at this!